2. Like PratsMusings FB Page here. Once you like the page, tag 3 friends and let them know about this give away. The tagging should be public. Tagging can increase your chances of winning. 3. Leave a comment on the blog and/or my FB page telling me what you love about the Rustic Art products and which one has been your favourite one till date! If you don’t leave a comment I won’t be aware of your participation! You can leave a comment on my blog or the post on my FB page. 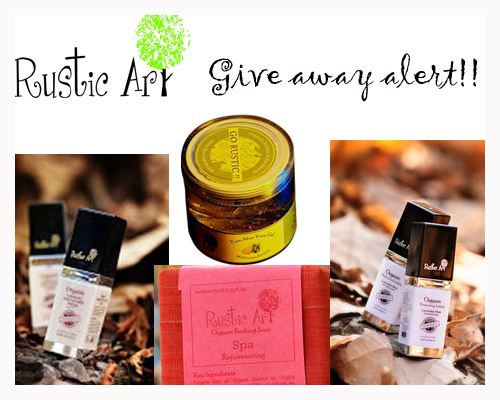 Contest/ Give away closes on 7th July 2013.
hi thanks for the lovely giveaway…i read many reviews of rustic arts products but unfortunately i can never get them in my area ur giveaway will give me chance to win them..im really excited thanks alot….. I haven’t really tried rustic art products but I have been waiting to try them. I am on an organic / natural kick and would love to try more safe and (harmful) chemical free products. Im going to go by ur advice here…was thinking of going to try olay…but an organic version has to be better! I advocate organic products because I believe in its pureness and goodness. It does not have any harmful ingredients and its good for the skin! Do try out the product and let me know how you like it! joined your giveaway , like the fact the products are naturally based and never have tried them so am excited if I do win . Hey thank you for participating. Can you please tag 3 friends in the FB post? I’ve pinned it to the top!Thank you! Wohoo.. i am drooling at the giveaway 🙂 Thanks alot for coming up with this.. I have been using their product for a while now and I love them as much as my boys do! I have liked Rustic art and your page in FB , following you by post as well . I love the aroma of their products. Each & every product of Rustic art has excellent aroma. I’m addicted to that aroma. Liked both the FB pages. Hey the contest is closed 🙂 will be announcing the winners soon!